How electric meter works? Electric meter records the consumer energy consumption. Energy is the product of power and time. You may be already heard about the term “kilowatt-hour”. This is the unit of energy measured by the electric meters. The power considered is the real or true power that is consumed by the users. 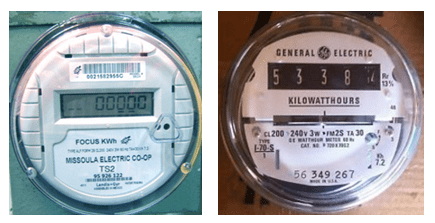 There are two common types of electric meters. One is the analog and the other one is the digital. There is also the so called hybrid meter which is a combination of analog and digital. Analog and digital is better understood in terms of their display. A digital meter is simple and straight forward as the digits are already given in a readable numeric form. An example of digital meter is below. Electric meters are installed in walls of houses or buildings. In some places, they are installed above the ground such as in the top of an electric post to prevent tampering it. Meter tampering is very common to some places. Below picture shows some electric meters installed in the top portion of the post. Electric meter measures the energy consumed by the users. Energy is the product of real or true power and time. Let me do a simple math here. Electric meter unit is expressed in kilowatt-hour (kW-hr). Once you know your energy consumption already, multiply this to the price per kW-hr. For instance you consumed 200kW-hr a month and the cost of every kW-hr is 0.1$, then your total bill is 200kW-hr X 0.1$ = 20$. What is Real or True Power? From the term itself, this is the true power consumption of the end user. Is there a so called not real power? The answer is YES. There are the so called reactive and apparent powers. Let me do a little math to explain this further. I made an illustration below that relates these three types of power. True power is the actual power that each appliance consumes. 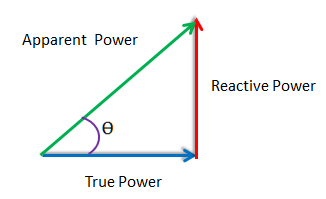 Reactive power is referred to as an imaginary power that is usually during generation. While apparent power is the phasor sum of the two mentioned powers. How the Electric Meter Reads Power to Charge to the Consumer? Electric meter measures the input voltage, current and the power factor. These are always the three elements to get the real or true power. An electric meter always follows below equation. Power reads by the meter is not only simply voltage and current that you can measure using a tester. The third element that is very important is the so called power factor. What the Consumers actually Pay? The consumer will actually pay the energy. Energy is the total real power consumed or the kilowatts times the total number of hours in a specific period, say a month. You may often hear or read about the term “kilowatt-hour” or abbreviated as “kW-hr”. Energy price is based on per kW-hr. For instance you consumed 100kW-hr and the price per kW-hr is 1$, then you will pay 100$. The consumer will only pay for the actual power he consumed. In other words, he will only pay for the power drawn from the location of the meter. Supposing the meter is located 10 meters from your house, then whatever power drawn within 10 meters going to your house will be charged to you. The location of the meter matters especially with high current loads and poor power factor. 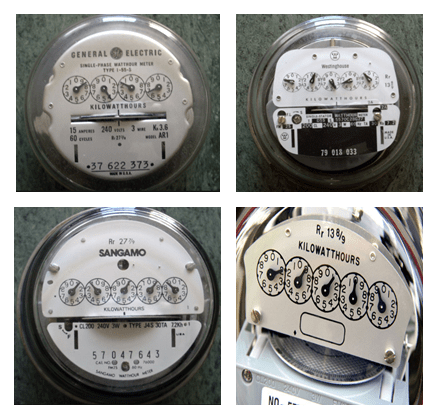 Why is the Location of the Meter Matters to your Electric Bill? If the load has a bad power factor (like motors, coils and capacitive loads), it will result to a high current peak on the line. This high current peak will have high true current value or the so called RMS value. If the energy meter is far from the load, this means a longer wire needed. The resistance of the wire is always directly proportional to its length. With longer length, the higher the resistance is. This will result to a higher power loss. 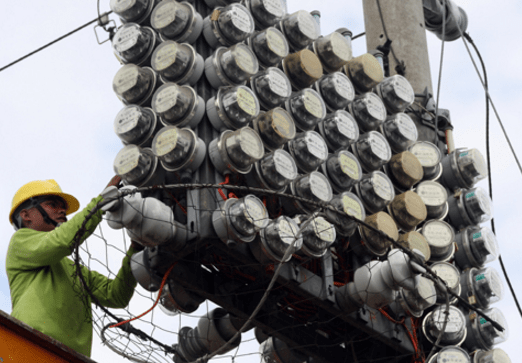 Previous Post:Smart Grid Technology: Why do we need it? Excellent stuff, I really learned a lot from it. Thanks very much, now I am less ignorant. You may be already heard about the term “kilowatt-hour”. This is the unit of energy measured by the electric meters. The power considered is the real or true power that is consumed by the users.